You are looking at 1oz or 2oz of Renaissance Night Treatment – it is the best value on the net! Renaissance Night Treatment is your face lift in a jar. Containing 72% organic ingredients, simply leave this mask on overnight and awake to amazing results. * The Vitamin A (Retinol), Vitamin C, Vitamin B5 (Panthenol), Hyaluronic Acid and CoQ10, work synergistically to stimulate collagen 1, collagen 111, and elastin fibroblasts. 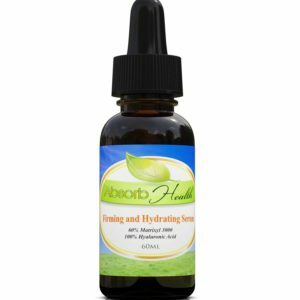 This stimulation supports the healing and repair response in the skin to increase skin thickness and reduce the appearance of fine lines and wrinkles. * It is our strongest Night Treatment. As always, our products contain no phthalates and no sulfates. Other products of ours that you may be interested in include: 60% Matrixyl 3000 Firming Serum, Vitamin C (20%), E, and Ferulic Acid Serum and Anti-Blemish Mask. All orders ship within a day and come with a money back guarantee. Free U.S. shipping on all domestic orders over $75. Thank you for shopping with Absorb Health, and please remember us for all your Mind, Body and Spirit solutions! Directions for Use: Apply all over face and neck. Can be used under makeup. Safe to be used morning and night for a light treatment or just in the morning with one of our specialized cremes at night. Ingredients: Organic Aloe Barbadensis (Aloe Vera), Isopropyl Palmitate (Palm Oil), Kosher Vegetable Glycerin, Glycolic Acid, Cassia Angustifolia Seed Polysaccharide (botanical hyaluronic acid), Olive Oil Squalane, Lactic Acid, Cetyl Alcohol, Stearic Acid, Hydrogenated Castor Oil, Glyceryl Stearate, Organic Carthamus Tinctorius (Safflower Oil), Cetearyl Alcohol, Cetearyl Glucoside, Stearyl Alcohol, Ubiquinone (Coenzyme Q10), Silk Protein Amino Acid Blend (Sodium L-Pyrrolidone Carboxylate, Sodium Lactate, LArginine, L-Aspartic Acid, L-Pyrrolidonecarboxylic Acid, Glycine, L-Alanine, L-Serine, L-Valine, L-Proline, L-threonine, L-Isoleucine, L-Histidine, L-Phenylalanine), Butyrospermum Parkii (Shea Butter), Organic Simmondsia Chinensis (Jojoba Oil), Panthenol (Vitamin B5), Phytic Acid, Phospholipids, Tocopheryl (Antioxidant), Lecithin, Pyrus Malus (Apple), Citrus Medica Limonum (Lemon), Saccharum Officinarum (Sugar Cane), Dipeptide Diaminobutyroyl Benzylamide Diacetate (peptides), Cymbopogon Schoenanthus (Lemongrass), Ascorbyl Palmitate (Vitamin C Palmitate), Acetyl Hexapeptide-3, Sclerotium Gum, Potassium Sorbate, Sodium Hydroxide, Phenoxyethanol, Ethylhexyl Glycerin, Xanthan Gum, Allantoin, Tocopheryl Acetate (Vitamin E Acetate), Pentylene Glycol, 0.5% Retinol, Polysorbate 20, Potassium Phosphate, Wildcrafted Camellia Sinensis (Green Tea), Citric Acid, Benzyl Alcohol. Disclaimer: These statements have not been evaluated by the Food and Drug Administration. This product is not intended to diagnose, treat, cure, or prevent any disease. Individual results may vary.